It seems that religious holidays regulate our lives each year. Whether we are of eastern or western orientation they play a major role in our culture and social structure. People who have no religious affiliation or interest often feel confronted by what they perceive as truly outmoded doctrines. Our calendar regularly brings seemingly sanctimonious dates endorsed by mass media marketing to further contradict unfamiliar beliefs about God. This being out of place perception is felt by immigrants from other cultures who now endure unaccustomed celebrations of faith in their host country. Our higher minded vision really wants to include a more encompassing relationship of religion and philosophies about faith and divinity into our everyday life. However, certain traditions defining God argue that the all knowing power that created our universe and our unique individuality can only be seen by ones inner eyes. Still other God visions typically see only profitability in words, services and paraphernalia reflecting their theology. 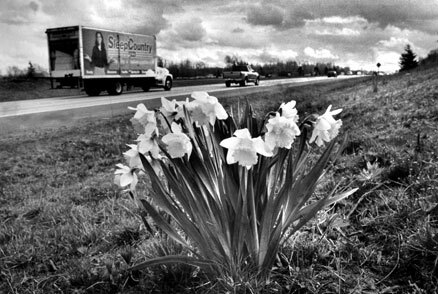 These Easter time daffodils found growing along Interstate Five honestly exemplify Gods handiwork coexisting with mans habitual preoccupations.